The 4th Annual Vermilion Parish Job Fair will give job seekers the chance to meet with local employers and learn about career opportunities in the area. JOB SEEKER ADMISSION IS FREE TO ATTEND!!! 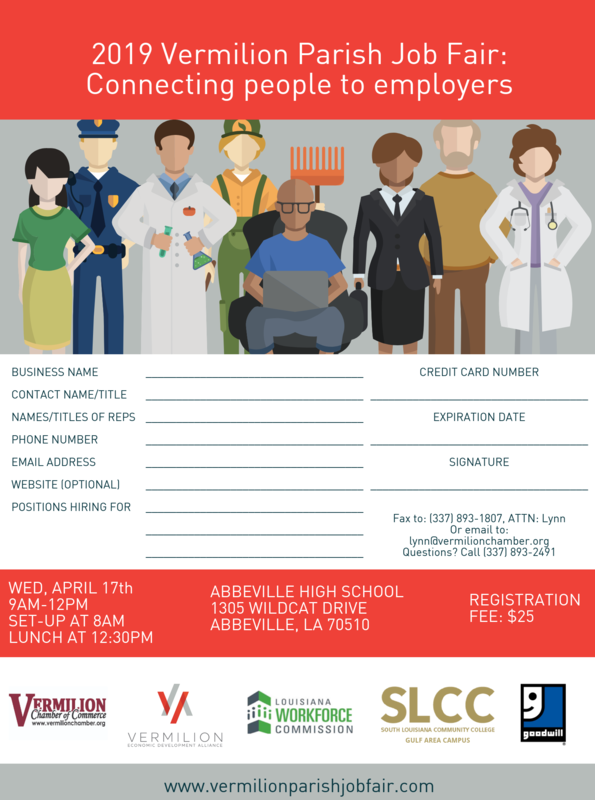 The Vermilion Parish Job Fair - hosted by Workforce, Economic Development, and Chamber partners from around the region - will take place on Wednesday, April 17, 2019 from 9 a.m. to 12 p.m., at Abbeville High School. This event will gather numerous employers who would like to promote their available jobs and career opportunities in a variety of fields*. Job seekers from across the state are invited to meet with your team and fulfill your workforce needs. ​Employers can reserve a booth for your complany by completing the attached REGISTRATION FORM and emailing or faxing to Lynn Guillory at the Vermilion Chamber (FAX: 337-893-1807 or EMAIL: lynn@vermilionchamber.org). OR REGISTER ONLINE now through the chamber website by clicking "REGISTER NOW" button above! ​Registration due by April 10, 2019! *Employers who have positions open at the time of the job fair will get priority placement. Commission-based only employers will not be permitted.